What is a beavertail vehicle? A beavertail vehicle is one of our specialised haulage trucks, and is ideal for carrying items of equipment on wheels, or even other smaller vehicles. Its distinctive name comes from its rear loading ramp, which is able to fold down very close to the ground, just like a beaver’s tail – hence why it is called a beavertail vehicle. 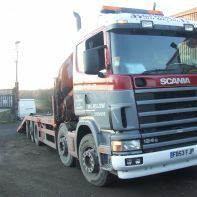 You may see very similar specialised haulage trucks referred to as having a dovetail, although a dovetail truck will typically still need ramps to load equipment on to it, whereas with a beavertail vehicle the last part of the tail itself is typically the ramp all the way down to ground level. Our 30-foot beavertail truck has a carrying capacity of 12 tonnes and a rigid front-mounted crane, making it even easier to load. If you need a crane vehicle but a beavertail truck is not essential, we can also provide rigid vehicles with a front-mounted or rear-mounted crane. These are a little shorter in length – around 26 feet – with a rigid flatbed trailer capable of carrying up to ten tonnes of materials or equipment.